Steed Society's Female Success Factor: The Digital S.H.E., a free event sponsored by U.S. Cellular, took place over the weekend at Chicago's Society Art Gallery. 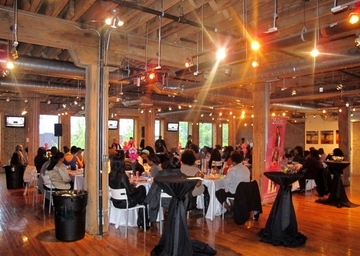 This was the first year that I hosted this national event, and in a nutshell, female executives and community leaders gathered to tell the back stories behind their glory, all in an effort to inspire others. This year's event, featured Tragil Wade, President of The Wade's World Foundation and sister of NBA superstar Dwyane Wade, Rita Coburn Whack, owner of RCW Productions Inc.; a Random House author, three-time Emmy winning television and radio producer, (Harpo Studios), and Michele Thornton, CNN's Director of Multicultural Ad sales. 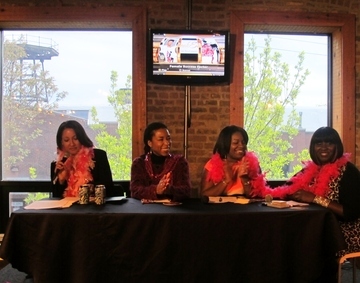 The panel shared how they had to do an about-face in order to find success. The Wade family grew up in the Chicago gritty neighborhood of Englewood. Tragil had to step up to the plate and take responsibility for her siblings at a very early age because of their mother Jolinda's battle with substance abuse. Fearing the streets would claim her brother, Tragil shipped Dwyane off to live with relatives and to give him a chance to survive. Tragil Wade was educated in the Chicago Public Schools, in the mid '90s she moved to San Diego and graduated from Crawford High School, later to earn a teaching certificate in Early Childhood Education from San Diego City College. She returned to Chicago to teach at Community High School District 218 and earned a Bachelor's Degree from Chicago State University. "This is so much bigger than basketball," Wade told the ladies as she detailed the journey that took the family from poverty to a position of philanthropy with the Wade's World Foundation. The Wade family has a deep philanthropy reach in Chicago, as Wade explains, because there are family members who still reside in the city and they refuse to forget from whence they came. Today Jolinda Wade is free of drugs and is a pastor. 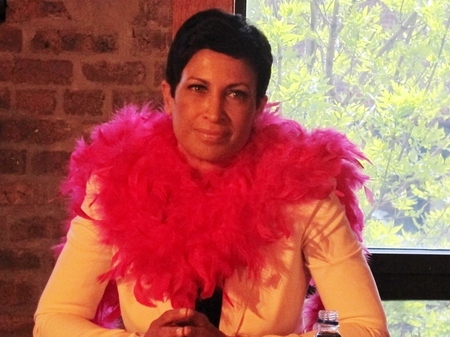 Michele Thornton, Director of CNN Multicultural Ad sales, was living the high life with her rich NBA baller boyfriend, who let her drive his fancy car, but on her birthday refused to buy an $18 CD for her. "He told me no because he could," Thornton says of the incident that instilled in her the desire to do for herself. "And I said, nobody would ever tell me 'no' again." Thornton explained that she worked to rebuild her brand immediately. " I lost weight, I hired a voice and diction coach. I focused on my education, and at 26 years old, I went back to school. I worked at a hotel in the daytime and I cleaned people's houses at night. And that was more gratifying than a [a rich boyfriend] who wouldn't buy me an $18 CD. I felt better about myself. I worked my behind off and I didn't graduate from college until I was 31 years old. So you can push your re-set button at any time." Rita Coburn Whack, three-time Emmy winning producer, encouraged the attendees not to be driven by money alone when making career decisions, and to broaden their networks to include other cultures. "The leaders of the industry will be the people who can connect across cultures now. You need to be able to, through the internet, or through the people you work with connect with people in other cultures and connect with them deeply. You need to know where they are coming from." 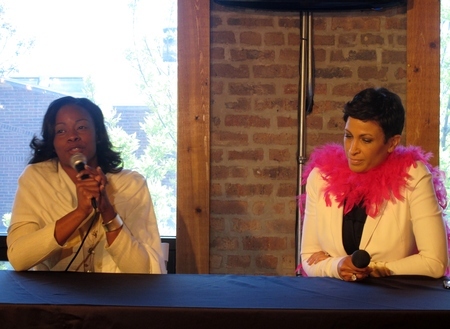 A second panel included digital divas, women who left the traditional workspace and found their calling online: Lutonya M. Lang of the IndustryBuzzz media network, Cynthia Boykin of the WhatUNeedIs newsletter and Stephanie Green of Soleil's-To-Dos entertainment and society calendar. 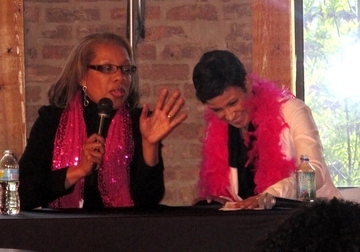 Christina Steed, VP of Flowers Communications Group moderated the event. 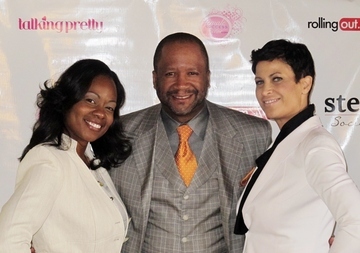 For more information about The Steed Society's Female Success Factor, visit www.femalesuccessfactor.com.